You can plot a route taking in up to 200 locations and calculate the distance between them all. Calculate distances not only between the thousands of cities included in the application's database, but also between geographical coordinates, marked with a virtual "pushpin" on the globe or the map. Using our Route Map feature, you can recreate the routes of famous historic journeys (like Howard Hughes' flight around the globe in four days or Scott and Amudsen's race to the South Pole) which will serve as a great educational example during the geography lesson. 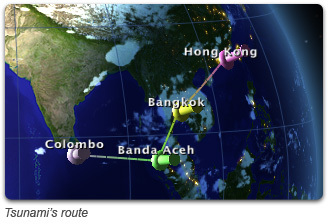 Plot the route of a forthcoming trip - or one you've always dreamed of making. 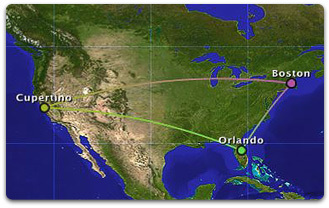 You can see just how far you have to travel and then "fly" your route at the click of a button. To get you started, we've included some classic routes such as Amelia Earhart's last flight, Columbus's first voyage, and Drake's circumnavigation of the globe. More routes are being plotted and posted as free downloads. Apple's "find everything" Spotlight search engine can find your routes wherever you have placed them on your hard disk!